Valero Energy Corporation is a Fortune 500 company based in San Antonio, with approximately 22,000 employees and expected annual revenue of more than $90 billion. The company owns and operates 18 refineries throughout the United States, Canada and the Caribbean with a combined throughput capacity of approximately 3.3 million barrels per day, making it the largest refiner in North America. Valero is also one of the nation's largest retail operators with approximately 5,800 retail and branded wholesale outlets in the United States, Canada and the Caribbean under various brand names including Valero, Diamond Shamrock, Shamrock, Ultramar, and Beacon. Please visit www.valero.com for more information. Valero's refinery in Ardmore, Oklahoma, processes medium, sour crude oil from both domestic and foreign sources. It produces more than 90,000 BPD with major products including conventional and low-sulfur gasoline, conventional and low-sulfur - and recently, ultra-low sulfur - diesel, asphalt and refinery-grade propylene. In addition to production and processing, the refinery also has more than 2.4 million barrels of refined-product storage capacity. To take advantage of modern process control technology, the Valero Refinery in Ardmore, Oklahoma, recently replaced an existing legacy control system with a state of the art distributed control system (DCS) from Yokogawa. Valero Ardmore decided to replace the system because "(it) represented several different generations of equipment and it became apparent to us that a clean sweep approach would be more advantageous," said Ken Ferris, Refinery Engineering Manager. "A complete modern system could offer us the important opportunities for significant improvements via advanced process control (APC) and similar enhancements after initial system installation." As maintenance costs increased for legacy system components and functionality of newer systems can achieve production improvements, the decision to change was made. The selection criterion was based on reliability, features, critical functionality, and cost. "Our decision to replace the existing legacy DCS - plus expanding control for several units in the refinery - came about as we considered possibilities for interfacing schemes to extend capabilities of our existing system," explains Ken Ferris, Refinery Engineering Manager. A team composed of representatives from all refinery departments began screening available choices and soon narrowed the choices to two automation suppliers. At that point, intensive evaluation of relative strengths and weaknesses for each of the two vendors included systems functionality, project execution, and support capability. System reliability was a primary consideration because safety is the single most important element emphasized by Valero management. Before any significant operational improvement can be extracted through advanced process control, the plant must have safe and reliable operation. Another key systems functionality evaluated was system response speed. 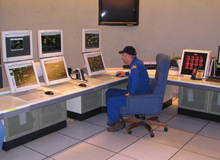 For example, the system ultimately selected had the capability to scan all I/O points for the entire refinery and graphically display results in only one second. Operators could essentially operate in real time, fast enough to apply remedial action before a potential process anomaly or equipment failure occurred. The evaluation process concluded with Valero selecting the CENTUM CS 3000 R3 system from Yokogawa due to its reputation for reliability, integration capabilities, rich set of refinery applications and functions, and life-cycle cost. Most of the plant's existing instruments and controls were used, with new I/O devices replacing antiquated legacy equipment where needed. A unit formerly operated manually with pneumatic equipment was also included in the scope for the new system. Each control/data loop was examined and "fine tuned" when appropriate. Installation was achieved through a series of planned hot cutovers for more than 6,000 points. The sequence of these changeovers was determined by considering the urgency of a unit to meet operational needs plus the physical requirements involved with replacement logistics for large equipment in the rack room. The most complex cutover involved the hydrogen purification unit and the platformer unit, where complicated batch sequence programs had to be switched over to the new system. "One of the key elements leading to the 'smooth' installation," says Mike Wallace, Valero Instrumentation Manager, "was an initial meeting with our people and the vendor team. We all were very open and honest in discussing what was going to be needed and what to expect. Opinions expressed ranged from personal to technically complex, and responses came 'with no holds barred.' Out of that meeting emerged what has become a very professional and valuable vendor/user team based on mutual trust and respect." Just how well this group could actually function was sorely tested as installation neared completion. There was an incident of a hardware failure. To find the cause as rapidly as possible, Valero and Yokogawa complemented each other in ferreting out the problem's root cause. With a hot-cutover schedule pressing down, the culprit was finally isolated - corrosion from ambient hydrogen sulfide shorting out closely spaced connections on communication hardware. A modified hardware design solved the problem, and the refinery made changes to clean the atmosphere in the rack room where the hardware was located. More than 6,100 I/O points were connected to the system with only one minor recordable safety incident occurring during installation. This was especially important to the refinery since it had been accepted into the OSHA Voluntary Protection Program as a "Star Site," one of the safest refineries in the nation. Hot cutovers started in August 2004 and were completed in April 2005. 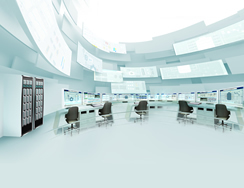 "One other factor helping our installation process, " said Ferris, "was a team we established to translate the legacy system into Yokogawa as we went along. We thus eliminated one potential source of delay and were ready to move ahead in completing the cutover schedule." "In almost all cases, operators are now progressively praising and liking the new system as they use and become familiar with it," comments Stan Kersch, instrumentation consultant for the refinery. "Some unit operators initially resisted various facets of display and control," he explains, "largely because 'things and actions didn't feel like' what they were used to with the legacy system. Now they are finding that it's really nice to not have to worry about units under their supervision; the system takes care of things without the constant operator attention formerly required." As the new system continues to meet performance criteria, Valero continues to look ahead. "We have evaluated very carefully the upgrade to FOUNDATION Fieldbus™ technology," explained Ferris, "primarily to have total plant asset management capability. This will include predictive maintenance tools for various mechanical devices - especially valves. We are also looking at tying some packaged PLC units into the system units. We feel some additional training in system maintenance and operating procedures will be helpful where timing/stabilization issues are involved, particularly if we decide to add some of the system enhancements currently being developed." It helped to provide a smooth project execution with no schedule and/minimal safety incidents. It provided an easy to use, easy to reconfigure interface that has resulted in numerous post-installation enhancements. It has minimized day-to-day plant operation problems including reducing the alarming factor. Thus, the refinery can concentrate more on problems like maintenance of mechanical equipment. The vital basic availability necessary for Valero now allows Valero to consider various other improvements through APC and other advanced capabilities. It reduced variability throughout the refinery, allowing for increased throughput and higher product quality.